It’s certainly been a while since I have been back in this space! And how I’ve missed it so. But December being December, there have just been too many things pulling me in all sorts of directions Dream beauty pro, that I have once again neglected the cozy little haven I’ve cobbled for myself over here. Work is the main culprit…as I’ve mentioned before, December being one of, in not the most, busiest times of the year for me work-wise. So that has left me on a hamster wheel of double shifts and late nights Managed Security. December is also little C’s birthday…so we were busy with preparations for that too. Neither I, nor my budget, have ever been one for big parties (plus I have, since childhood, a healthy fear of mascots and clowns). Little C, from what I have seen of her in children’s parties, doesn’t seem to be too fond of clowns, magicians, games, or loud party hosts either. She is more a physical child who enjoys running around and getting sweaty than sitting and (woe is me!) following directions. So I put myself in her 3-year-old shoes and thought, “what would I want to do if I was her?” Dream beauty pro hard sell. I went with my gut and booked her favorite play gym for her party and was so glad I did. Little C, and the few other kids who attended, seemed to have had a grand time! Between all this, I have had less time for Christmas present shopping and general Christmassy things. I am, however, happy to report that I did manage to put together some homemade gifts again this year. Yes, part of it is a repeat from this year (although I have added a few new blends to the lot). But it’s the thought and effort that count right? 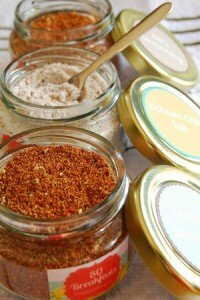 Spice mixes make great presents in my opinion because they are not easily perishable, are a cinch to make, and encourage the recipient (hopefully) into the kitchen and affords them some freedom and creativity to do with them what they will. I used this rub from Jen of Use Real Butter, which I’ve already gifted to friends three years ago, the Christmas that Little C came into our lives. The other mix is what I have quite broadly dubbed as Mexican seasoning, which in fact is the Taco seasoning that I featured in my column in Yummy Magazine March this year. The third is Sichuan chili salt which I have based on a recipe from Donna Hay Magazine (coincidentally enough from her holiday issue in 2007 – yes, I am a mad fan and have almost all her magazines). - In a dry pan over high heat, toast the salt, Sichuan peppercorns, and chili flakes for a minute or two, tossing the whole time, until fragrant. - Immediately transfer to a plate to cool. Once cool, place in the bowl of a small food processor, or spice grinder, and process until just combined office chair. A couple of very short whizzes should do it Dream beauty pro hard sell. - Transfer to a bottle and store in a cool dry place. Just increase the recipe if you need more. 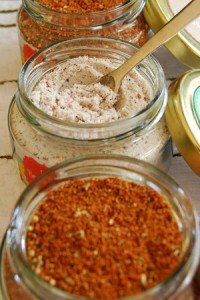 BBQ Seasoning – Rub generously on chicken leg quarters with a little olive oil and grill or roast. Add to cooked white beans, along with sautéed onions and bacon, and pop in the oven until bubbling for quick barbecued baked beans. Rub on fish fillets and sauté, serve with a tomato salad. Mexican Seasoning – Add to sautéing ground beef for instant taco filling. Rub on chicken thigh fillets and pan fry, slice into strips and pile onto soft tortillas with salsa and sour cream. Sauté onions, garlic, and chorizo squeezed out of its casing, add cooked kidney beans and some water, add Mexican seasoning to taste…a cheat’s chili con carne! 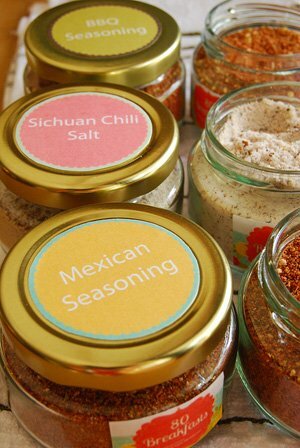 Sichuan Chili Salt – Dust some peeled shrimp, chunks of fish fillet, or crab with rice flour and pan fry, when cooked toss with the Sichuan chili salt and serve immediately. Grill or pan-fry slices of unseasoned pork belly (or firm tofu) and serve with the Sichuan chili salt on the side. Add some to a vegetable stir-fry. I doubt that anyone out there is as disorganized as I am, this far into December, but just in case you are still stumped for Christmas present ideas…the ingredients for the perfect present may already be in your own kitchen! We will be in the thick of holiday celebrations this weekend, and then we are off to spend the New Years in Macau (suggestions for things to see and places to eat are welcome!) with our whole family, so this is most likely my last post for 2012. I did not want this year to close however without wishing you all a very happy holidays! Hopefully with the people you love most in the world, and a lot of great food and fun times thrown in. YOU are a big part of the inspiration that keeps this blog going…so thank you!! I look forward to seeing more of you in 2013!